Less Than Reality: I Got My Amazon Kindle Fire and I Love It! I got my Kindle Fire from Amazon.com in the mail today and I love it. From the free, fast delivery to the product itself, I'm completely thrilled with my Kindle Fire. I have been seeking a tablet at an affordable price. Because of my opposition to the price, I ruled out an iPad. And while I saw lots of other tablets at low prices on the market, they got average reviews and came from no-name brands. So when I saw the Kindle Fire, I was thrilled. The Amazon Kindle Fire is from a trusted brand, and I know that Amazon has great customer service, so I was all in when the Kindle Fire hit the market. My Kindle came in the mail today and it's awesome. It's lightweight, has a great look and works flawlessly. It was incredibly user friendly. When I turned it on, it immediately prompted me to set it up on my home Wi-Fi network and loaded the latest software. It came pre-loaded with my my info from Amazon, so it knew my name and had my music from the Amazon Cloud ready to listen to. It also comes pre-loaded with Pandora, so I had that set up in a matter of seconds. Setting up my email was so easy. I was able to load all three of my email accounts, view them separately and view a shared inbox. I absolutely LOVE my new Kindle. It's so intuitive to use, lets me easily surf the web, and has an easy to use touch screen that reads my touch really well. The letters on the screen are big enough that I can type easily without having to hit backspace all the time. 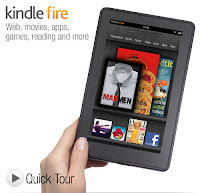 Would I recommend the Amazon Kindle Fire? Absolutely. The software works great, downloads are smooth and fast, and the tablet itself looks great. Plus, the $199 price tag can't be beat. I 100% percent recommend this for everyone.